by Gail F. Stern (ed); M. Mark Stolarik (pf); Robert P. Foreman (fr). Jews have been coming to the New World since colonial times & have made a unique contribution to our common culture. By stressing religion, education, industriousness, self-help, & works of charity, American Jews have not only been immensely successful in the U.S., but have served as role-models for other ethnic groups. These values & accomplishments are reflected in the Philadelphia community. The Balch Inst. was pleased that the Fed. 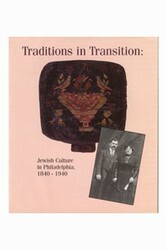 of Jewish Charities selected the Balch Lib. as the official repository of the Federation's Archives Center. The Institute's museum has been able to draw upon this extensive collection to present this comprehensive exhibition on the variety of Jewish experience in Phila. between 1840 & 1940. Illustrations.